We are delighted to share news from ExhibitorLIVE in Las Vegas where 2020 Exhibits was recognized for creative design and the outstanding use of technology for the third year in a row at Exhibitor Magazine’s PORTABLE MODULAR AWARDS. 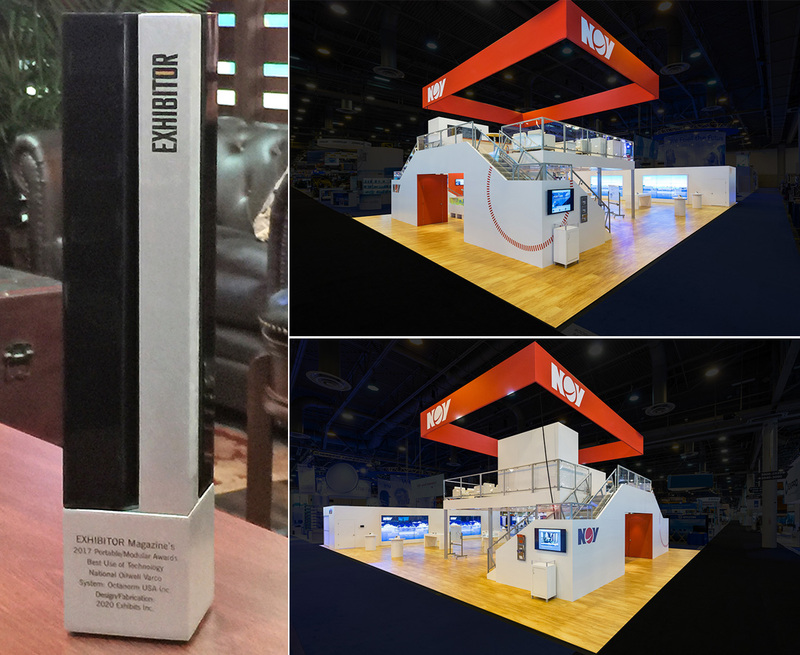 As the fourth Portable Modular Award win for 2020 Exhibits, the top prize in the Technology Category was awarded to 2020 Exhibits for our work with NOV. Recognizing the innovative and effective use of technology or technological components within a display, the judges found an impressive Technology Category winner in the NOV Offshore Technology Conference 2016 experience. The Portable / Modular Awards recognize modular exhibit design and are the industry’s preeminent competition for creators of portable and systems-based exhibits and event structures. Judged by a highly esteemed group of marketing design experts, the company accepted the PMA’s Best Use of Technology award in Las Vegas at ExhibitorLIVE 2017, the leading trade show for marketing and tradeshow professionals.